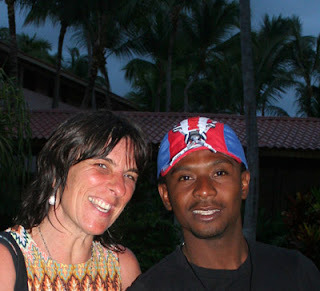 Andre and I spent three days at an all-inclusive resort called Natura Park Eco-Reserve on the east coast of D.R. near Punta Cana. Our friends Hubert and Antonia invited us to join them there. Hubert is from NJ and speaks mostly English. Antonia is Dominican and speaks mostly Spanish. I introduced them last summer when Maya and I invited Antonia and her friend Nena to join us at a time share in Cabarete on the north shore of D.R. Overall, I wouldn't reccomend Natura Park. It was overpriced for what you got, which always dampens the good time I could be having. Their website -- both Hubert and I remember seeing it -- promises free wireless DSL in the rooms. Instead, they had a tiny internet center where you pay $5 per half hour online. 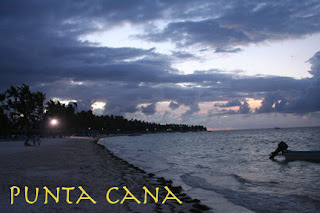 Which is why I'm writing this blog entry back in Santo Domingo. The night before our departure Andre got a terrible toothache. The Tylenol a neighbor gave him wasn't enough. There is a 24-hour pharmacy not far from here, but he considers it too risky to go out at night for any reason. So he spent the whole night in pain. I gave him an ice pack and had him gargle with salt water, but didn't know what else we could do. I was hoping it was just a cavity and wishing for a really good dentist, not a typical third-world dentist who pulls teeth first and asks questions after. So I found some names online of dentists who had studied in the U.S. Finally around 5 a.m. I convinced Andre it was safe to walk over to the pharmacy. The painkillers they recommended for molars worked really well. I called the resort in Punta Cana, hoping to change the reservation for the next day. The receptionist recommended a good dentist not far from the hotel. I gave him a call and he said he could see Andre that afternoon, so we went ahead with our travel plans. Five hours and four buses later (we were told it would take 3 hours), we arrived at Natura Park resort. The dentist picked us up in his SUV and drove us back to where we'd been an hour ago waiting for a bus. I thought it was strange that we'd called him several times along the way and not once did he recommend we come to him first since it was on the way. As it turned out, Andre had an infected wisdom tooth that wasn't able to break through the gum. The dentist did a quick surgery, charged us $200, then took us to the pharmacy for another $50 worth of pain killers, antibiotics, cotton balls, mouth washes, sprays and a special tooth paste. At least, he was very competent and Andre was able to enjoy life again. It looks like it's healed really well. The good points about the resort were the garden setting, the white sandy beach, the friendly staff, and the seafood restaurant. The beach was lined with palms, the seaweed that washed up was raked and wheelbarrowed away daily, there were few tourists and almost no vendors. The water was clear and warm, so I spent a lot of time swimming and floating. Andre doesn't swim and has an unrealistic fear of sharks, but I got him to hit the volleyball back and forth in the water with me. Even with sunblock, I got burnt, so I had to wear a t-shirt after the first day. We had hoped to play more sports, but the ping pong tables and pool table were out of commission. We did work out in the gym once. And Andre joined some Spaniards, Germans and Italians in an exciting game of soccer, but it was hard to control the ball because of the sand. Afterwards, all of the players were coated in sweat and sand. I was the hero who brought a pitcher of water over from the bar. Hubert and Antonia used my translation services to work through a lot of their misunderstandings. Hubert is my age and Antonia is younger than Andre, so they have that difference as well. I can understand Antonia's frustration because Hubert is only able to come down for 3 or 4 days every two or three months. He's in the beginning of what looks like an ugly divorce with one little boy in the middle. 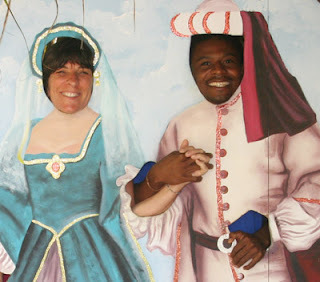 The good news is, because she's a tourist police she thinks she could get a visa to visit Hubert in the U.S. Andre and I were forced to apply for a fiance visa and wait nine months since he's Haitian and not wealthy. As an environmentalist, I was very disappointed by the "eco-reserve" part of the resort. They claimed to be ecological by not changing sheets or washing towels. They also saved a lot of energy by having air-conditioners that barely cooled the rooms. But they used plastic cups by the thousands. The tropical garden setting was beautiful, with flamingos and other exotic birds roaming around. The geese, however, kept attacking the guests, which was quite comical unless you were their target. The nightly entertainment was mostly karaoke, but the best show was when staff members dressed up like famous stars such as Michael Jackson, Tina Turner, and the Supremes and then danced and did lip-sync to their hits. Really talented! Somehow we got lucky on the bus ride back to Santo Domingo. We got here with two buses in three hours, just as we were supposed to. It's funny, but I feel more relaxed and at home here in Andre's little apartment than at the so-called 5-star resort. The next day we went to the Brasilian embassy with our fingers crossed and guess what? Andre got the three-month multiple entry visa. Even the consulate himself came out to shake our hands. Andre thinks it's because of Brazil's and Haiti's mutual love of soccer. With a multiple-entry visa we might be able to go to other South American countries also. We'll probably go from September to December, come back and spend Christmas with his family in Haiti, and then visit Jamaica in January if he can get a visa. By then we should be just be a month or two away from getting his U.S. visa. I think I'll keep my fingers crossed that everything goes well between now and then. Tomorrow is the Big Day. We travel six hours by bus to Port-au-Prince to meet his family. Andre's never brought a girlfriend home before, so this is the Big Deal. I've been doing a crash course to relearn the broken French I knew years ago. It's coming back, but the pronounciation is always the hard part about French for me. I feel like I'm imitating some cheesy movie when I try to pronounce it right. Andre has to repeat the words over and over until he's satisfied that I'll be understood. If I could just read and write with his family I'd be fine. I'm even trying to learn a few Creole phrases so they'll have more to laugh at.